Some of my fondest memories are set inside a smoky thatch-roofed kitchen, my small, wizened grandmother at her fire hearth concocting some kind of tasty meal for her large family. You never knew who would be sitting at her table, for my cousins were numerous, and her heart generous. From chaya leaves chopped and sautéed with shallots in cohune oil, to her version of sweet tomato jam spread out on homemade bread, it was always a delicious surprise for us. 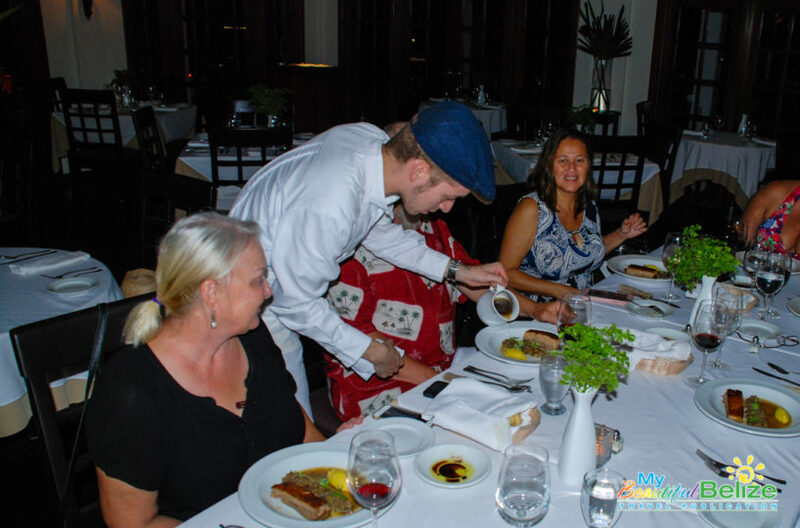 Decades later I found myself sitting at one of the most romantic restaurants on Ambergris Caye, enjoying a meal that brought back memories of that small, smoky kitchen. 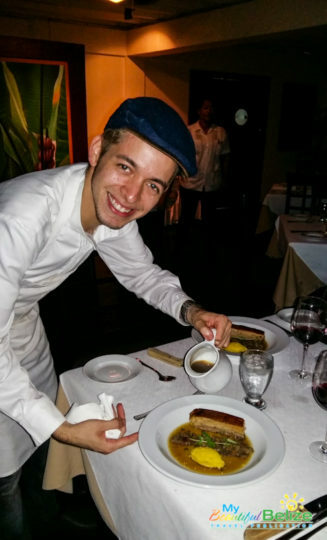 But there was no wizened grandmother at the stove; instead, it was wunderkind Venezuelan Chef Omar Pereney, who at age 21 has accomplished so much more than I have in my 35 years on this earth. His resume is astounding, having made international headlines when he earned his first executive chef title at the age of 16. Latin America recognizes him from his four-season appearance on The Gourmet (Latin America’s top-rated cooking channel) with Yo Cocinero. In 2015, he opened Houston’s Peska Seafood Culture as Executive Chef. 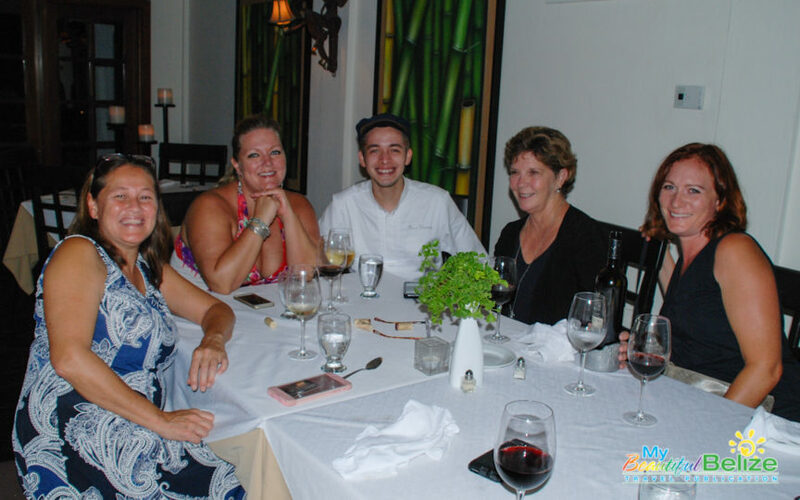 He continues to evolve, currently seeking to become a certified sommelier, and also running Pereney Catering Co. His visit to Belize was through his partnership with Chris Tripoli in the well-established A’la Carte Foodservice Consulting Group. 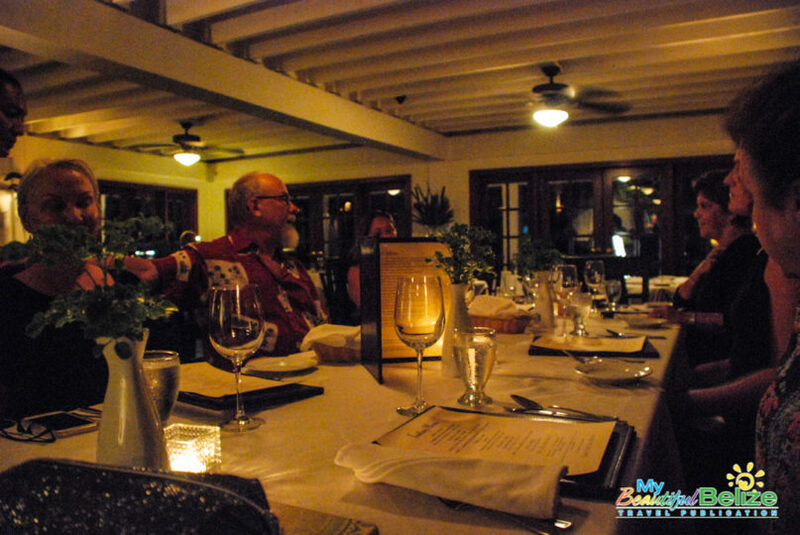 Together, they work on bring exciting changes to their resort and restaurant clients. 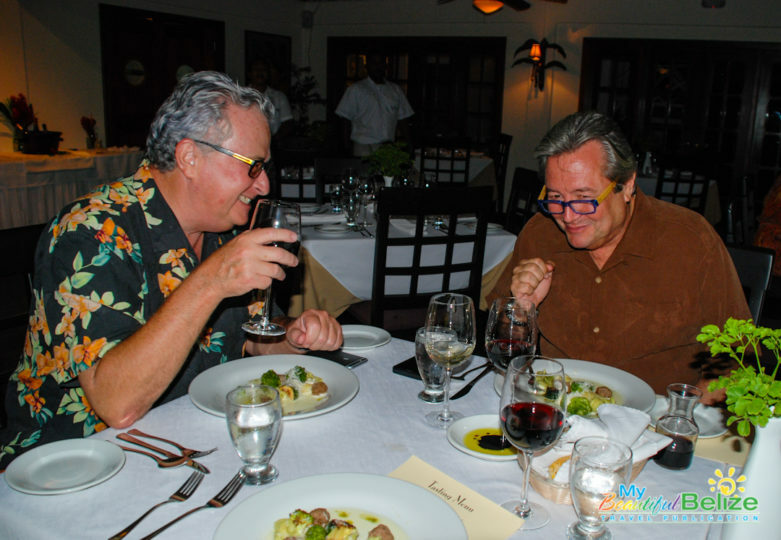 Managing Directors of Victoria House, Janet Woollam and Brent Kirkman were thrilled to host a special tasting meal featuring some fresh new items. 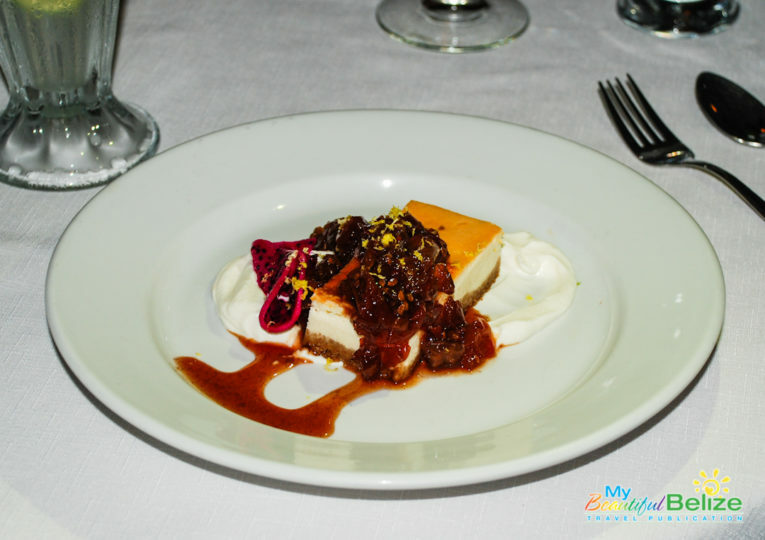 The menu itself capitalized on freshly-sourced, local ingredients, and we were the lucky tasters! There really has been a very pleasant pattern happening lately, and I love it: my phone rings, and when I answer, I’m being invited to a delicious dinner and/or cocktails. I’m so lucky, and grateful! This particular meal stood out because of its simplicity and attention to flavors, some of which I never thought would work together. For example, I’m a simple girl who likes her watermelon straight from the rind. I’ve heard of such things as sprinkling salt on this sweet fruit, but I always wondered what monster does that! 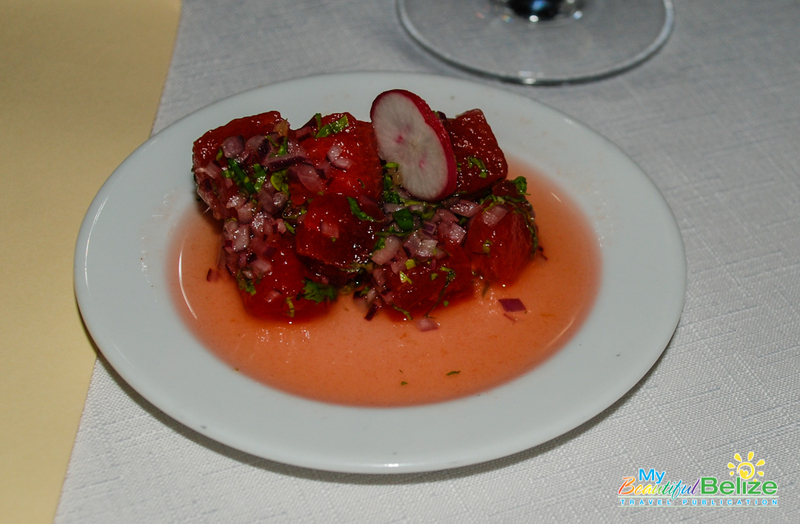 Well, guess I’ll switch over to the dark side because the compressed watermelon salad starter was utterly divine. Bites of watermelon were tossed with mint, basil, red onion and cilantro, the sweet fruit mixing wonderfully tart with sharp notes of herbs. 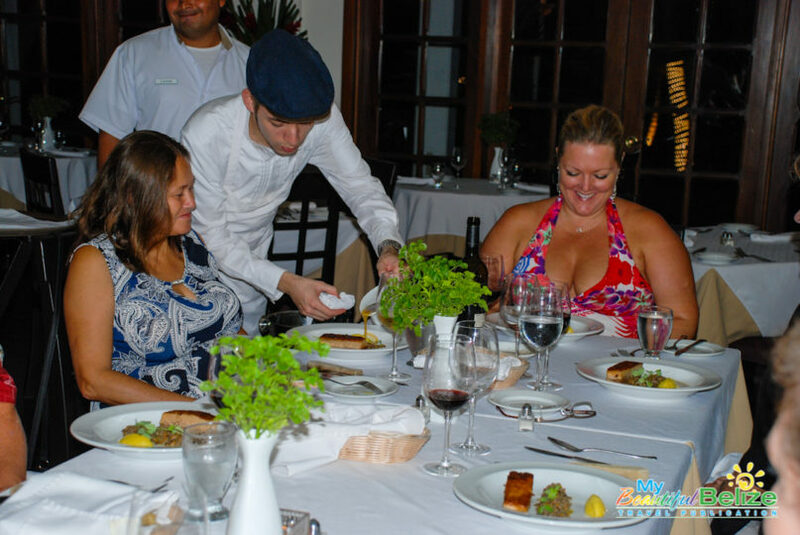 The surprises kept coming, as lobster ceviche made its way to our table. The traditional ceviche on the island is chunks of fresh seafood (like lobster) marinated and ‘cooked’ in lime juice, tossed with some fresh vegetables and eaten with fresh corn tortilla chips (or scooped up by the spoonful). 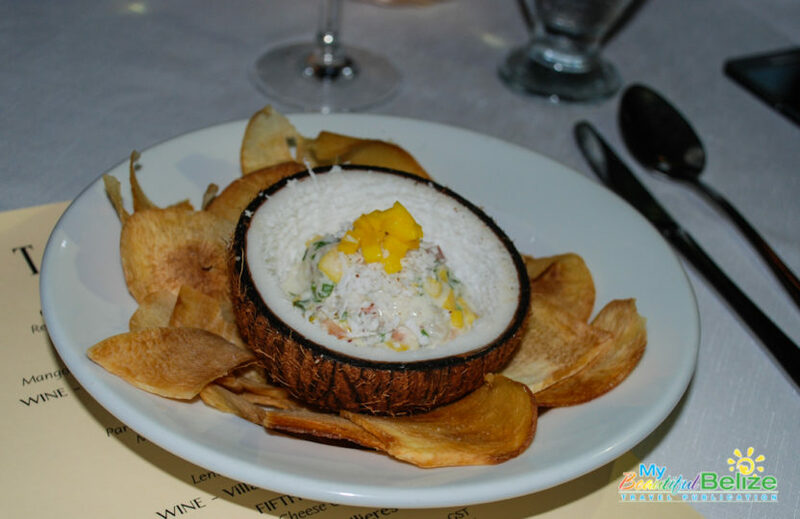 Pereney went a different direction, presenting chunks of fresh lobster marinated in a creamy coconut milk with hints of sweet mango, sharp ginger and bright cilantro, all in a coconut bowl still lined with tasty coconut meat. Crispy cassava chips made the perfect foil for the creamy ceviche. It was the complete opposite of my ceviche expectations, yet it was thoroughly satisfying and an excellent way to showcase the sweetness of our Caribbean Spiny Lobster. After being delightfully surprised with the first two courses, I couldn’t wait to taste the pasta dish. For many Belizeans, pasta primarily means a thick rich, sauce, heavy and unctuous – and generally comfort food that demands a nap right after. 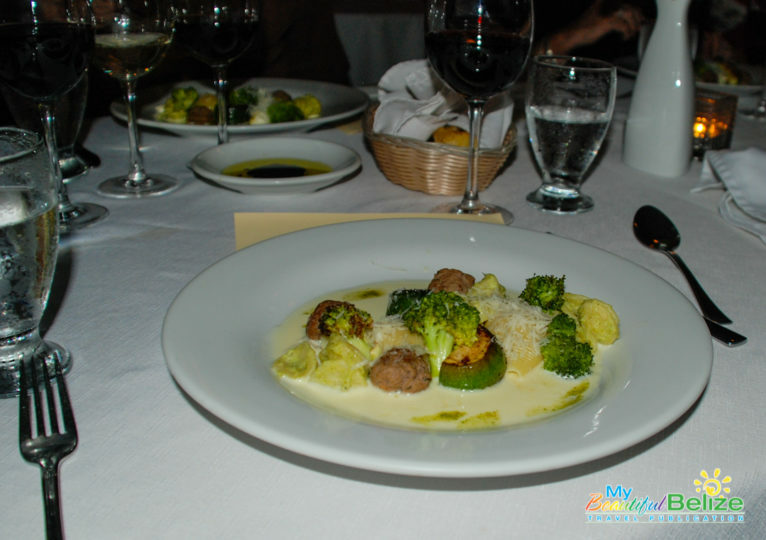 However, the pasta that Pereney sent forth had perfectly cooked pasta shells, alongside meatballs, roasted broccoli and summer squash to round out the light and satisfying dish. 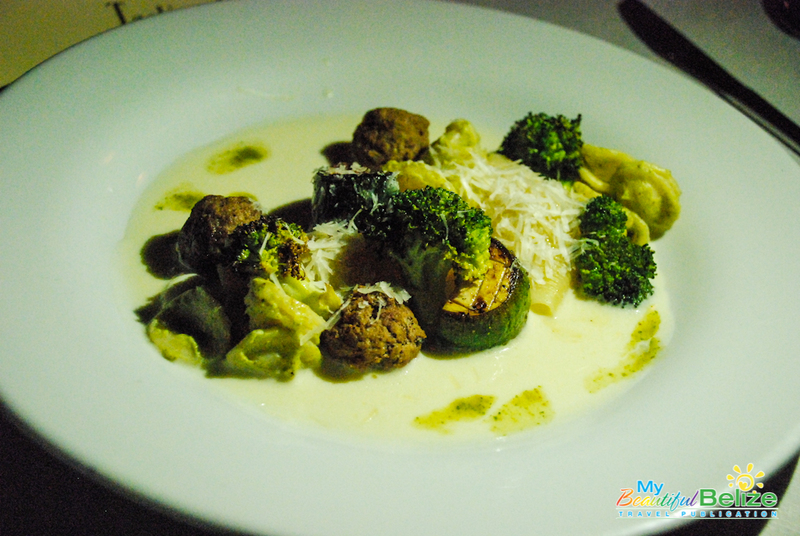 The sharp parmesan-based sauce was utterly divine, perfect with either pasta or vegetable. Considering there was another course ahead, the light dish was just right! 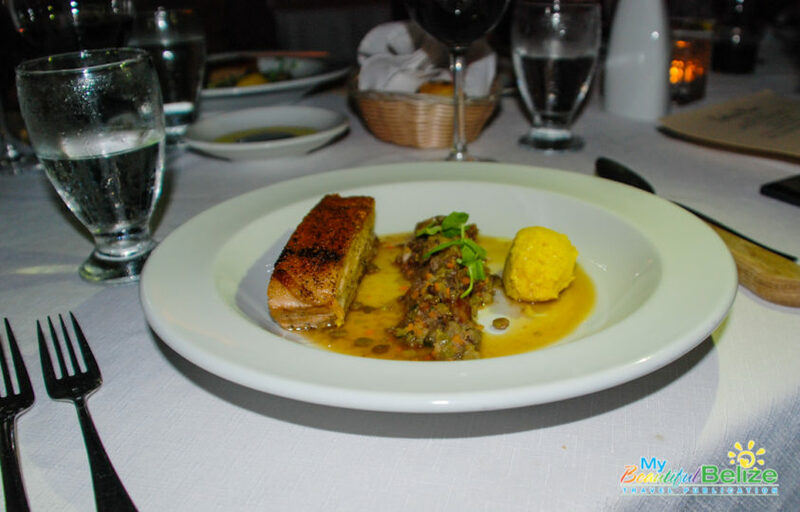 For our fourth dish, Pereney had prepared a Braised Pork Belly, accompanied by smoky lentils, plantain mash and a special gravy poured at the table. We were offered a steak knife in anticipation of our hearty carnivorous dish, but it was completely unnecessary, as the pork was so wonderfully braised it was fall-apart tender! The sauce over the smoky lentils reminded me of those days by the fire hearth, watching a bubbling pot as tendrils of heat rose up high. The plantain mash was another surprise – something so simple yet so satisfying. While we generally serve fried plantains alongside our national dish, I remember being treated to steamed ripe plantains as a little girl. The tradition fell by the wayside over the years, but I was reminded that what was once old, could be new again. Just as I was thinking that, Chef Pereney surprised us with a wonderful dessert of goat cheese cheesecake, topped with tomato jam. The goat cheese gave the cake a tangy flavor, which when paired with the sweet, fruity tomato concoction, made for a fabulous bite. I felt vindicated; yes, tomato jam is sweet and does exist! 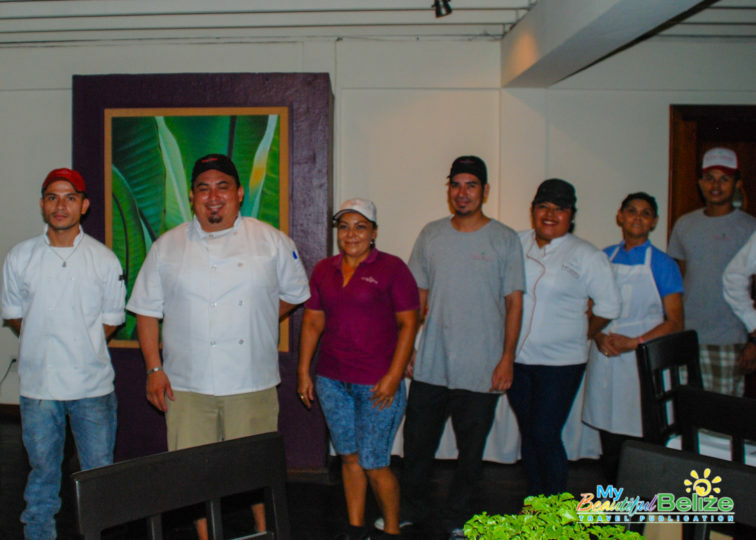 From the little thatch-roofed kitchen in that small Maya village of years ago, to a stunning colonial style resort restaurant on one of the most beautiful islands in Belize, memories of heartwarming meals came alive once again through the hands of a young, talented chef from Venezuela. It was proof that food is a universal language, and when the right ingredients are combined, a meal can take you back in time. To enjoy these and other tasty treats at La Palmilla at Victoria House, call 226-2067 for reservations.